See great Mousoleum and mosque tower. 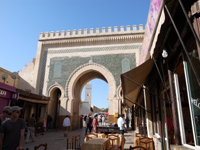 In Fez, walk in the UNESCO Wolrd Heritage ancient Medina. 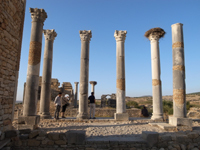 Day trip to Roman Ruins, Volubilis, and Sacred Islamic town Moulay Idriss. Then drive onto Marrakech to see souk, an old market, and Islamic architecture. Great opportunity to learn history and art of Morocco! Once a capital build by a powerful leader, Moulay Ismail.